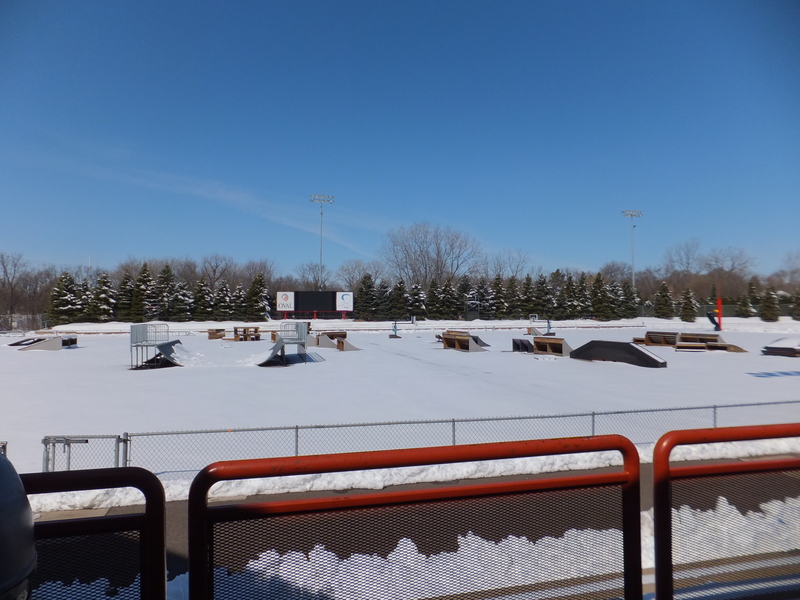 Perhaps you held out hope the new stadium would be your new winter skating home. Those hopes have been dashed – read about it here. Now is the time to think about trying ice speedskating. Try short track and long track skating sessions are available or will be soon. I strongly encourage you to take advantage of the opportunity. Even if you don’t intend to take it up long term this is an easy way to say you have done it, or to give a kid a chance to try. The Greater Minnesota Speedskating Association (GMSA) will be hosting the Try Speedskating events, and participating in talent searches involving local youth hockey players and figures skaters. If you know someone that might be interested see the e-mail addresses below. Adults & Children: Every Sunday night at the Plymouth Ice Center . Skates will be provided and highly skilled skaters, such as Greg Oly and Alex Harvey, will be available to provide technique instruction. My first lap on ice. All you really need to get started in masters speedskating is a pair of skates, some ice . . . and at least 30 years of living under your belt! If you grew up skating and are now getting back into it after a “life gets in the way” break, you can probably skip this section and go right to the specifics about the current Masters skating scene in Minnesota and nationally. If you are intrigued by speedskating although you have never done it, but anxious to give it a try, here is some information that might help you get going. First, there are three types of speedskating: short track (think Apolo Ohno); long track (think Eric Heiden and Bonnie Blair – or Shani Davis (for those not as old as Kaari); and marathon skating (think…well, no one you’ve ever heard of! Marathon skating is crazy and fun, but a small sport. ) Long track skating takes place on a 400 meter oval, and there are not many of these. The big ones in the US are in Roseville, MN (outdoor), West Allis , WI (covered), and Salt Lake City, UT (covered); Canada has indoor ovals in Calgary, Alberta and Fort St. John, BC. However, there are some smaller “unofficial” ovals in other locations such as Duluth MN; and many Canadian cities have official-size but unrefrigerated outdoor 400 meter ovals. 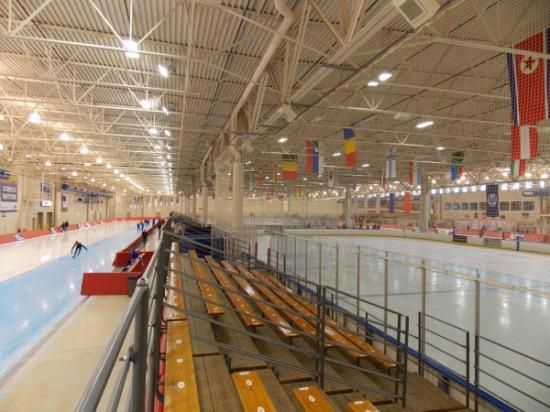 Short track is done on hockey rinks, and is therefore available in many more locations than is long track. Marathon skating is done either on long track ovals or on lake ice. Bemidji MN has had a lake ice marathon race as recently as a couple of years ago, but more marathons arebeing held in indoor ovals such as the Pettit National Ice center in West Allis, Wi. Short track, long track, and marathon speedskating, of course, all have their own types of racing. Short track races are almost exclusively “pack style”—that is, you’ll be lining up on the starting line with up to six other people, which means that strategy and passing are a large component of short track racing. Short track races are typically 500-3000 meters for adults. Long track races may be either “pack style” (also called “mass start”) or “metric” (also called “Olympic style.”). In pack style long track, as in short track, strategy, drafting, and passing come into play. In metric style racing, two skaters race at a time and each has his or her own lane so there is no opportunity to draft off of a competitor, and the skaters are all racing against the clock. Long track races are typically 500-5000 meters, and rarely 10,000 meters. Marathon races are pack style, and may be up to 50K long. 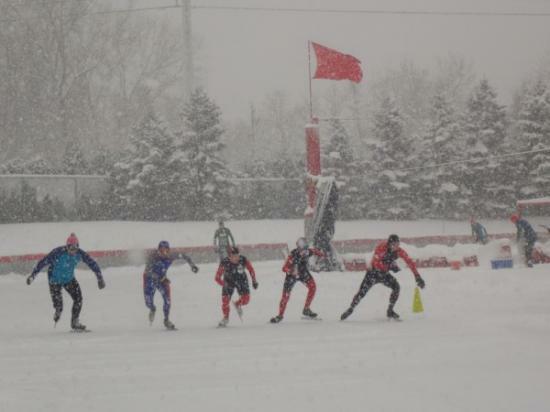 Even if you never intend to race, you need to know what type of speedskating you will be doing because the equipment is different for long track, short track, and (possibly) marathon skating. Long track skating is done on “clap” skates, in which the heel of the skate boot is free to lift off the blade during the skating stroke (although some beginning skaters choose to learn on “fixed blade” skates and then graduate to claps as they become familiar with the technique). Short track skates have fixed blades (that is, the heel of the boot does not lift up from the blade) and generally higher, stiffer boots. Both short track and long track blades can be mounted on some inline skate boots, depending on the type of mounting style the boots have. Marathon or lake ice skaters use long track skates or “Nordic” skates, which are blades that fasten to cross-country ski boots with cross country ski bindings. Nordic skates are not as light and supportive as regular long track skates, but are extremely warm and comfortable, and very stable on rough lake ice. Whatever type of skating you do and whatever type of skates you need, though, be sure they fit properly and are comfortable. Starting out with well-fitting, appropriate skates is a huge step in the right direction! Other than skates, and clothing appropriate to the climate conditions, you’ll need skate guards that fit long blades—speedskates are hand sharpened, which means you’ll be sharpening them, which means that you want to keep them as sharp as possible by never walking in them without guards. You’ll also, of course, need equipment to sharpen your skates—a clamp to hold the skates, called a jig; and sharpening stones. See the section below for links to places to get skates, skate guards, jigs, and stones. For information on how to sharpen skates, it’s probably best to ask a local skater to show you their technique. Most fellow masters skaters will be happy to help out! If you will be skating short track, you will need to find a local club with short track skating practice sessions. It is important to have padding on the hockey rink boards when you skate, so it’s best to find a club (who will put up pads for their sessions) and join them. Many short track clubs are open to beginners of all ages, and will help you learn the basics of speedskating . See the “links” section for information on Minnesota short track clubs. If you will be skating long track, you will need to find out when speedskaters have practice time on the local oval. Generally, it is very difficult to try to speedskate at public skating times (and some ovals actually prohibit it, although if you are a beginner and aren’t regularly knocking down small children, they may let you do it). In Minnesota, the John Rose Oval has several “adult long blade” sessions per week; typically these are during the early afternoon or late night. If you join the Greater Minnesota Speedskating Association, you will have access to the GMSA ice time, which is typically three nights and two weekend mornings per week. See the GMSA website and look for the “Important Forms” section. Even if you’ve done some hockey or figure skating and are pretty confident on skates, it’s best to look for a “learn to speedskate” class. Speedskating is an excellent lifetime sport and a lot of fun, but it can be frustrating at first and it’s good to have an understanding of the basics to help you learn as quickly as possible. See the section on Clubs and Classes at the John Rose Oval below for information on speedskating classes. If you will be marathon skating, you will either skate on a long track oval or a lake. Again, if you are a beginner it might be helpful to start with a class; otherwise, if you’re skating on a lake, just get out there and skate—and be careful! Sooner or later, you may decide that you want to see how fast you can go. If you’re involved in short track, your club will let you know about upcoming races. Typically, local short track races will either have a class for masters, or will divide skaters by ability and you may skate with some younger people. If you skate long track, pack style races are usually divided by age groups, but again, if there are no other masters available you may skate against younger skaters. Pack style involves racing strategy as well as speed, since skating closely behind another skater (“drafting”) allows you to conserve your energy and thus a “cat and mouse” situation sometimes develops in which all the skaters are trying to maneuver each other into taking the lead—especially at a windy outdoor oval! In metric racing, you simply go as fast as you can (no drafting or race strategy, since you are each in your own lane except when you switch lanes each lap) and see who gets the best time. In metric races, skaters are typically paired with someone of similar speed, regardless of age. See the section below for information on the types of racing that your local long track oval offers. There are also masters-specific long track events. These are typically open to masters skaters of all ability levels, and racers compete in 5-year age groups from 30 on up. Some of the races are metric and some are pack. All are great places to meet other masters skaters, enjoy some good competition, and just generally have a great time! If you want to race marathons, click here is a list of current races. Marathon races are typically two-day events, with a 25 km race on Saturday and a 50km race on Sunday. They are pack style races, in which finding a “pace line” and exchanging the lead with others is the best way to go fast. Many speedskaters (both Olympic athletes like Derek Parra and Chad Hedrick, as well as many masters skaters) began as inliners. Inline skating is great summer cross-training for speedskating (or, if you’re primarily an inliner, speedskating is great winter cross-training for inlining). The John Rose Oval is open for inlining (and free!) from May through September. You may even be able to put clap or short track blades on your inline boots. However, a word to experienced inline racers: long track speedskating, while similar to inlining in many ways, does require some adjustments to your technique (especially if you’re primarily a double-push skater). It may be frustrating at first, because your fitness and inline experience will not necessarily translate to speed until you get the technique mastered—but stick with it, it’s worth it! The John Rose Oval also hosts several racing meets each season. The John Rose Open, typically held in December, is a pack style meet open to all abilities, and it has specific classes for masters skaters. The John Rose Oval also hosts one of the American Cup Racing Series meets each year; this is a metric event that typically has a qualifying time requirement. It is open to masters skaters who meet the time standard, but does not have specific masters classes. The John Rose Oval also frequently hosts the National Age-Group Long Track Speedskating Championships. This is a pack style event that determines the National Champions in age groups from kids through 70+. There is no qualifying time for competing in this meet. Those with a bit more racing experience might want to go to the Pettit National Ice Center in West Allis, WI. The Pettit offers a variety of racing opportunties, including weekend time trials (metric) as well as metric and pack style meets. There are also some masters-specific racing opportunities available. The US Masters Single Distance Championships are held at the Pettit National Ice Center every January. This event determines the National champions in 5-year age groups from 30 to 80+, but is an inclusive event open to any and all masters skaters who want to race. In addition, the Pettit has been the host of the Masters International meet (which varies between pack and metric style racing) for many years. For those who are willing to travel farther afield, the Masters Allround Games and Masters Sprint Games (known to masters skaters as “Masters Worlds”) are held yearly, often in Europe but occasionally in the US or Canada. These events feature the top masters skaters from around the world, but there are no qualifying time standards and typically the US has a large enough quota that any US skaters who wish to may participate. Thanks to the efforts of a dedicated group of masters skaters and the support of US Speedskating, the US has a unique program for masters skaters. Called Masters Category 1, or Mat 1, it is an honorary elite designation for masters skaters. Mat 1 status is achieved by skating (in any official metric event) a time equal to or better than 108% of the International Masters Speedskating Committee Record for the current year in one’s age group. Mat 1 skaters receive, at no or very low cost, a skinsuit from US Speedskating each year they qualify for Mat 1—along with the knowledge that they are among the best skaters of their age in the world. These lessons are a great way to learn the basics of speedskating, and they typically offer skate rental for those who don’t yet have equipment. Those who haven’t skated much, or at all, should take a “learn to skate” class (offered at hockey rinks in many communities) before taking the oval’s Learn to Speedskate class.